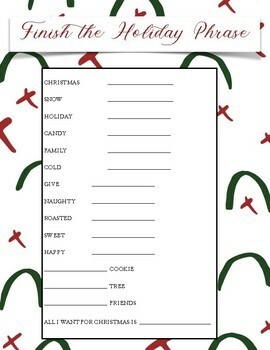 Print a copy out for each student playing. Each player with have to find a partner or you can assign one. They could pick someone they think will answer most like them. You will give them a certain amount of time to write in their answers to finish the phrase. So, Christmas.... one person might put Tree and the other Present OR they will both say, Christmas Eve. They will not tell each other what answers they will be choosing. The team with the most answers that matches, wins!